Yesterday, I went to Narnia. Really. Truly. Would you like to know more? I’m sure you would. I hope you’re sitting comfortably. Many years ago, when I was a wee thing of around seven or eight and not very keen on reading, my mum would sit on the side of my bed in my little box room with its dark green wallpaper that squeaked when I rubbed it, and read me C.S. Lewis’s, ‘The Lion, the Witch and the Wardrobe’. It is one of the few books I clearly remember from that time, and one of the reasons for this is that when my mum got to the end of the book, I would ask her to read it again. I didn’t read the book myself until about seven years ago when I read it, and the rest of the series, to my son. I loved it all, but the moment that completely and utterly captivated me most was when Lucy stepped through the wardrobe, the coats going on and on until she felt snow, and then out into the snowy lamp lit world of Narnia. I got head to toe goose bumps every time. It was as if all the magic I wanted was here, in these pages, in this world, and it flooded my head. Why did this magic work so well? I think partly it was because C.S. Lewis created the extraordinary out of something ordinary. All children have wardrobes, and the thought that they could be a door to another world was something that made the imagination somersault. It never occurred to me then that I might ever attempt create a magical world myself. When I saw the film at the cinema a few years ago, I had more than a tear or two when Lucy stepped through the wardrobe into the snowy white land and brought back every moment of magic I had felt at such a young age. It reminded me of what it felt like to be a child and to just be, because we have that joy as children, to purely exist and absorb ourselves in the magic of things. 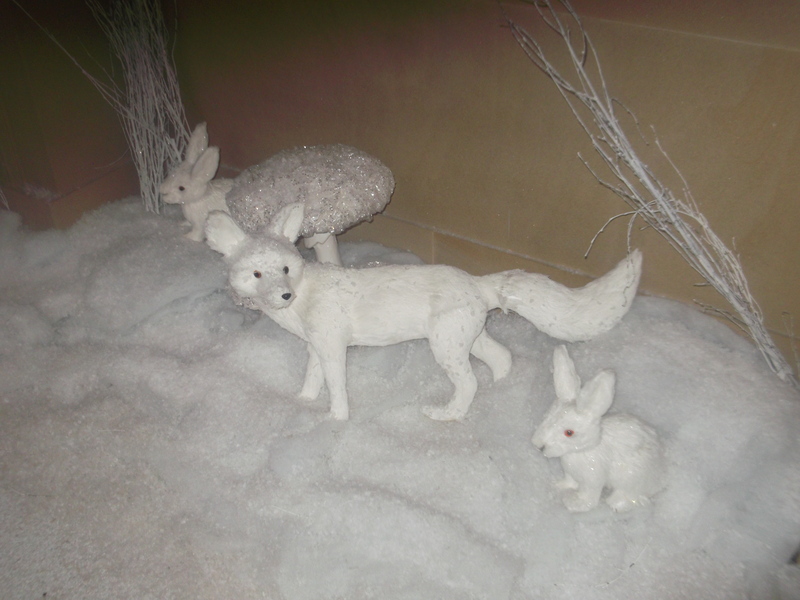 So, yesterday, when I went to Chatsworth House in Derbyshire to see how they had transformed it into Narnia, it was like being seven or eight again. Only this time, I didn’t have to close my eyes to imagine it all – my eyes were wide open. And yes, I filled up, quite a few times as it happened! 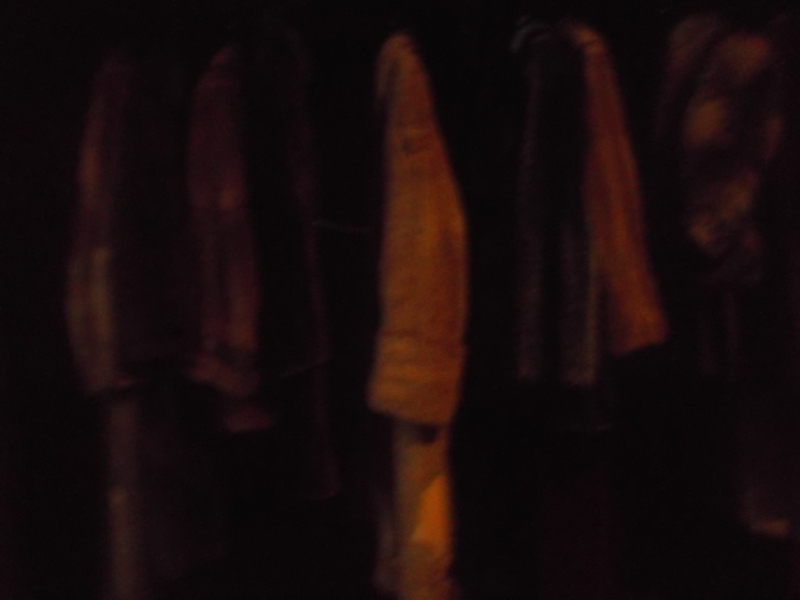 The wardrobe in semi darkness with its row of fur coats was truly amazing… it was just a wardrobe and a few coats… and yet… Stepping into Narnia was sublime. 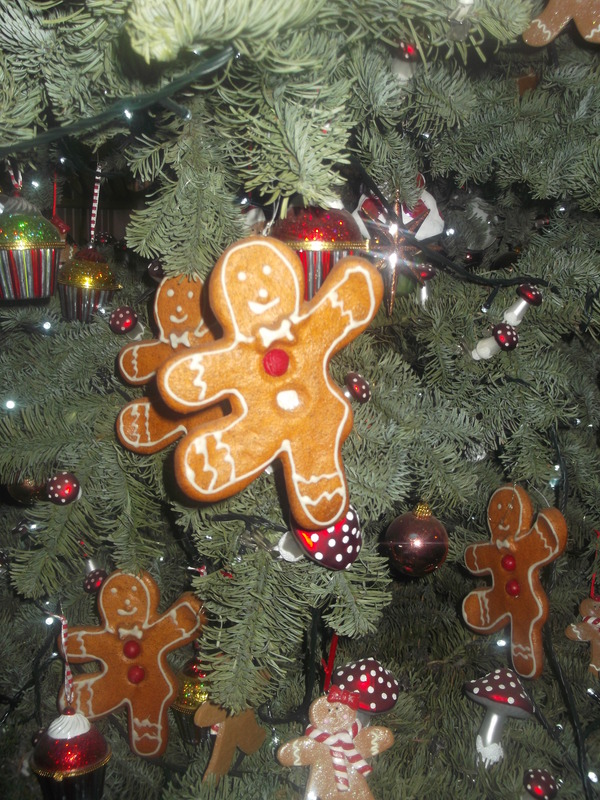 Mr Tumnus’s home with its Christmas tree decorated with ginger bread men, and the table laid for tea, was delicious. 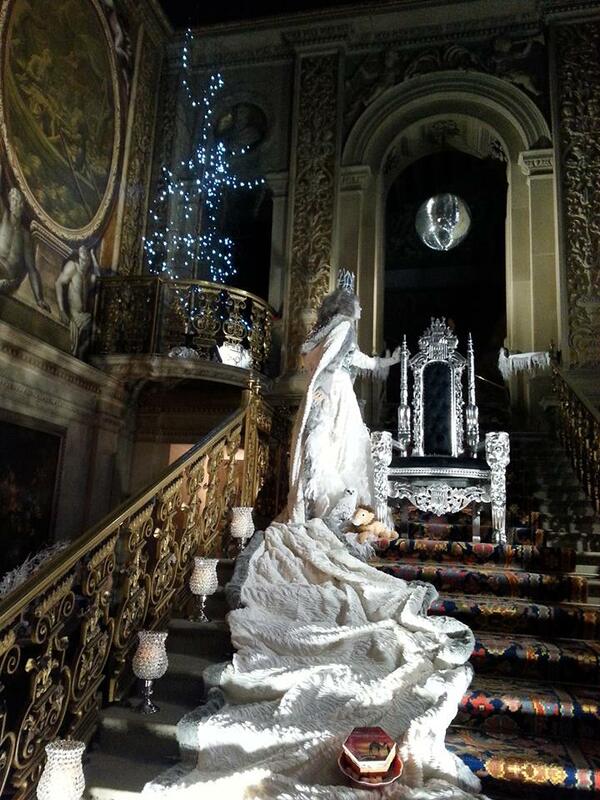 The Snow Queen, with her dress pouring down the stairs, punctuated by a box of Turkish Delight, was captivating. C.S. Lewis’s world was truly brought to life. But, perhaps most moving of all, was Aslan, laid on the stone table, ropes draped over his body, an Aslan who breathed (I kid you not) and mice who skittered about in front of him. He was in a room alone, lit by candlelight. I wanted to hide until everyone was gone, sneak under the rope and lie with him to ease his pain. In addition to all of this magic (can you take much more?) 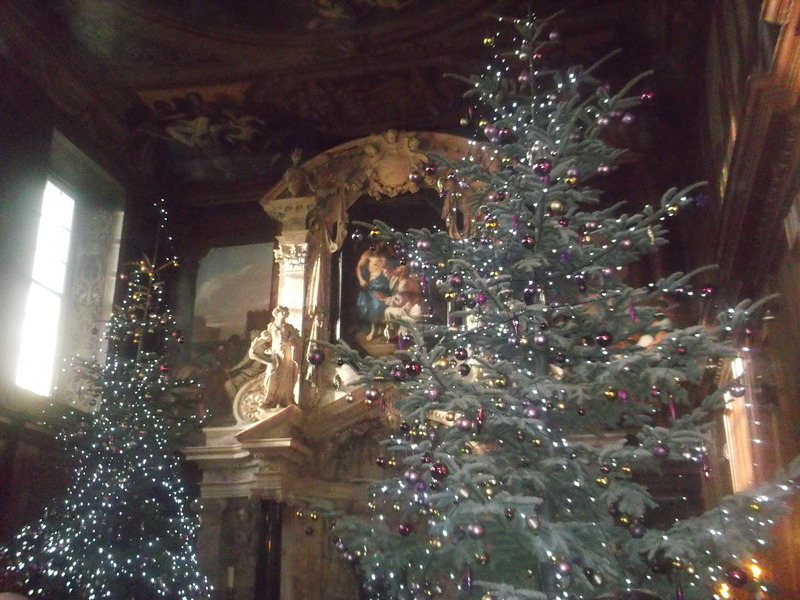 virtually every room was beautifully decorated with enormous Christmas trees, tiny white lights and candles. 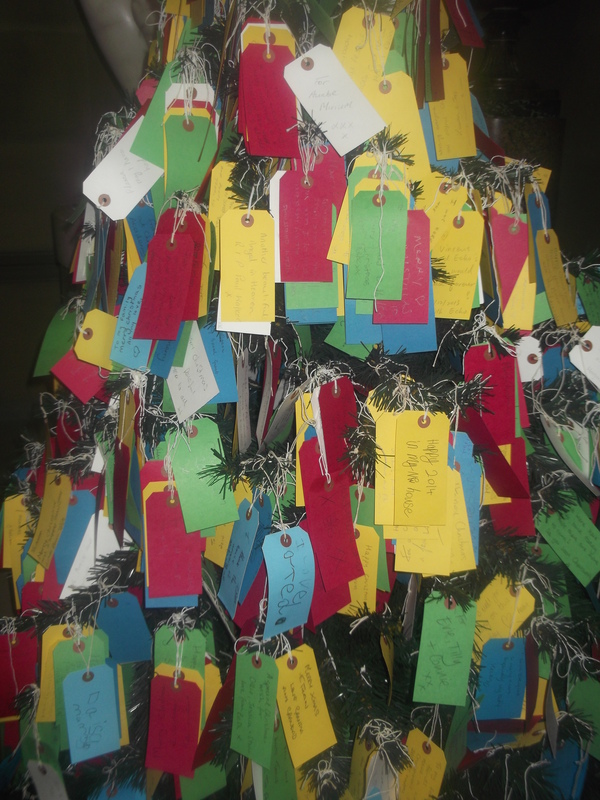 There was even a rose arbour and Christmas trees decorated with tags displaying messages from visitors. There had been a huge amount of people passing through and there must have been thousands of tags, making it almost impossible to see the original Christmas trees – it was quite something! We added to the collection, of course. When we left the house, magic still hung in the air. I think it hung in the air for everyone. I took it home with me and will hold it in my mind’s eye this week as I edit my current work in progress with its own unique world. I hope I can bring as much magic to is as C.S. Lewis did to his Narnia. Hi Sarah. It’s on until 23rd December – I didn’t know either until a student told me. Couldn’t miss it for the world. If you manage to go, go early though. We arrived at 10.30am and it was busy. When we left at 12.30ish the queue of cars stretched about quarter of a mile! Oh my goodness, what a wonderful experience. I so wish I’d been there! 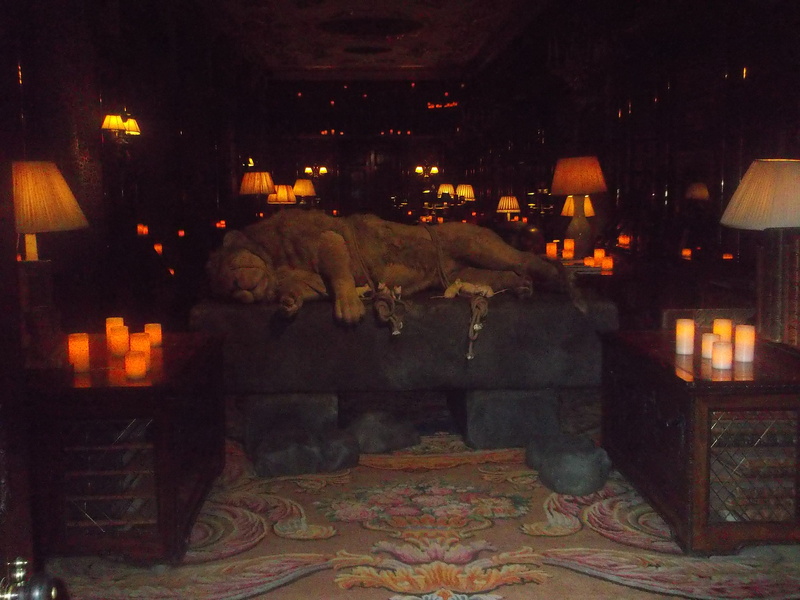 Though I think I’d have been dragged, sobbing, from Aslan’s room. I know what you mean! It was amazing, Sue. I was just one big goosebump! Sounds amazing, and I’m with you, I absolutely loved these magical books, and like you enjoyed them thoroughly both times around: reading them myself and then to my kids. What a magical day! Love the pics so much. Thank you, Julia. It was a magical day. Great to hear that you’ve enjoyed the books so much too. Aslan looks amazing… and the mice too! The fur coats are a brilliant touch too. It really doesn’t look like they could have done it much better. And what a wonderful history this story has for you. I didn’t come across it till later in life – read it in my late 20’s I think. Loved the modern film version they’ve shown on tv a few of times. Makes me cry every time. It really was lovely, Dean. The only thing they could have improved on was to make the wardrobe the entrance to Narnia – we passed it to go through the entrance. I am sure this would have had something to do with health and safety! I agree with you re. the film – always a tear-jerker. Aw, you’re welcome, Dianne. 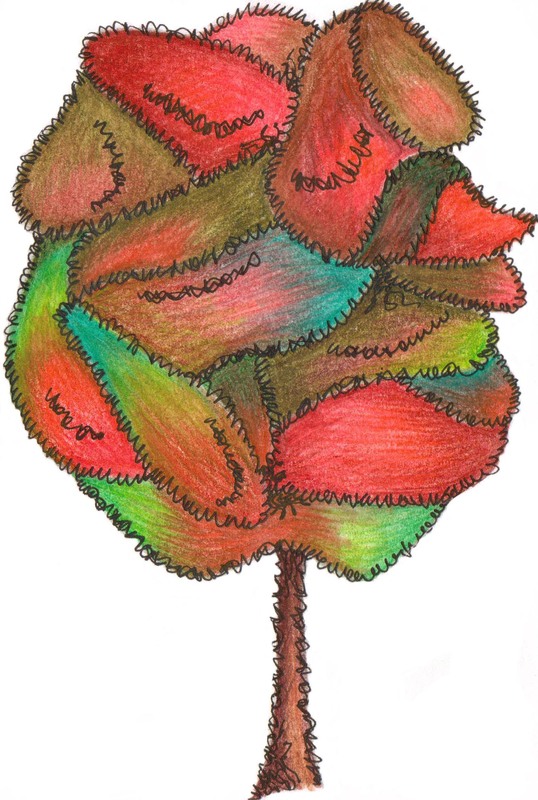 It’s lovely to hear how many people are inspired by the same stories – truly magical! It’s rare for something to be done that well. I’m delighted for you that it felt true to the scenes built in your mind’s eye. My son has just bailed from Derby Uni so I guess I won’t be passing that way to catch the recreation myself now. I too took the opportunity to read the Narnia Chronicles to my children, as I had missed out when I was a child. Being a very non-prolific book reader the films gave me a chance to be a book-snob for once – I thought the film wasn’t a patch on the book. And given some of our previous exchanges, Abi, I’m wondering how you feel about the allegorical references that CS Lewis wove into the stories? Martin, I didn’t even notice any allegorical reference *ducks and runs* – I think the pleasure for me was in the magic and charm of it all. Although I’ve analysed a multitude of texts for my English Lit degree, I’ve never given this book the same treatment. I’m glad you enjoyed the books though – I don’t think film versions are ever as good!